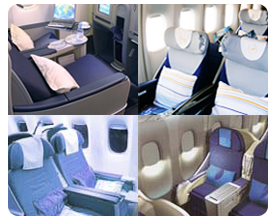 Most air passengers consider business class as a dreamland situated in the front of the aircraft with commodious seats, free drinks, fabulous meals and checked bags. There is constant clamor for a free or an inexpensive upgrade and many travel experts keep offering a lot of tips. The simple question is - is it possible to purchase an economy ticket and then resort to some tricks to get upgraded to the business class. This is not all that easy as many think and bulk of the suggestions and advices you receive are truly unworthy. Be clear about one thing - upgrades are a tightly controlled, regimented benefit that are doled out to some select passengers deemed deserving by the airlines. Many of the of repeated tricks used during earlier times to sneak into a business class flights have been busted with new technology, prolific resources on the web and revised strategies of the airline companies. There is a popular misconception that if you dress elegantly, the ticket agent, gate agent or flight attendant will be misled into allowing you an upgrade. Nothing can be farther from truth than this notion. If you dress in some luxury outfit thinking that you will be selected for an upgrade, you are going to be disappointed and probably just going to be uncomfortable travelling in economy class. If you find a vacant seat in the business class, do not think you can straightaway grab it. Please remember that flight attendants have manifests that will clearly show which passenger is sitting in which seat. So if you happen to find a seat up front that is empty and are able to slip in, you will be immediately noticed and told to vacate the seat. There is a suggestion that you should ask the flight attendant for an upgrade. Flight attendants have no control nor are they authorized to allow upgrades. The possibility is always there that one last business class passenger will be appearing right before departure and he would need the seat. After the boarding door is closed and if you are tactful and discreet, there is a thin chance that the flight attendant may agree. But these types of situations are rather rare. Some passengers may ask the ticket agent to put a special code on your e-ticket – under the mistaken impression that it will improve their chances of getting an upgrade to business class. This is a futile exercise as any request for upgrades are managed by a different system that is independent of your reservation. There is a weird tip that you have to be polite and courteous with air line employees and they will reward you with an upgrade. Please know that there is a set upgrade procedure and any act of favoritism or out-of-turn allotment is not feasible. It must be clearly understood that bulk of the upgrades are managed by a computer system that automatically upgrades those who pay for an upgrade and elite passengers that worked hard to earn them. Thus, your chances of getting an upgrade through some extraneous means are absolutely thin. It is prudent not to overly trust the airline employees or ticketing agents or flight attendants to help you get an upgrade. Besides, if the flight duration is less than four hours, it is never going to be worth the extra cost to upgrade to business class, no matter how cheap you can get it. Please also know that many flights may not have decent business class seats and all your efforts in getting a business class may be in vain.